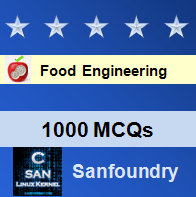 This set of Food Engineering Questions for entrance exams focuses on “Mixing-2”. 1. Which of the following is NOT an application of mixing solids in the food industry? Explanation: All the mentioned are applications of mixing in the food industry. 2. Which of the following is NOT a mixing involved with fluids in the food industry? Explanation: Soup powders involve mixing of solids. Carbonated drinks involve mixing of gas with a liquid. Oxygen transfer in fermentation broths involves mixing of gas in liquid again. 3. Which of the following does NOT include power required for mixing by an impeller? Explanation: Friction in the motor does NOT include power required for mixing by an impeller. 4. Power required for a gassed system is more than that required for an ungassed system. Explanation: Power required for an ungassed system is more than that required for a gassed system. This is because when gas is sent into the fluid via a nozzle, the density of the fluid near the impeller decreases and hence the power required for it is lesser. 5. Statement 1: Froude number relates the gravitational effect which is important when the liquid is agitated by an impeller. Statement 2: When NRe,i < 300, NFr is ineffective. Explanation: Froude number relates the gravitational effect which is important when the liquid is agitated by an impeller. When NRe,i < 300, NFr is ineffective. 6. With respect to the relationship between the power number and the impeller Reynolds’s number, which amongst the following statements is true? Explanation: In the turbulent region, the NRe,i, impeller Reynolds’s number, has no impact over NPo, power number. 7. Statement 1: In the transient zone, the power input depends on the density and viscosity of the fluid. Statement 2: In the laminar zone, the power input depends on the density only. It is independent of the viscosity of the fluid. Explanation: In the laminar zone, the power input depends on the viscosity only. It is independent of the density of the fluid. 8. Statement 1: For non-Newtonian fluids, another term called apparent viscosity is used as their viscosity changes with the change in the shear rate. Statement 2: For non-Newtonian fluids, between the transition region, the power number for non-Newtonian fluids is slightly higher than that for Newtonian fluids. Explanation: For non-Newtonian fluids, between the transition region, the power number for non-Newtonian fluids is slightly lower than that for Newtonian fluids. Explanation: Power required for an ungassed system Po is more than that required for a gassed system Pg. This is because when gas is sent into the fluid via a nozzle, the density of the fluid near the impeller decreases and hence the power required for it is lesser. 10. Statement 1: Flat blade/curve blade/arrow head/vaned disc turbines are generally used for gas-liquid mixing. Statement 2: Helical screw/ribbon mixer/gate anchor are generally used for solid-solid mixing. Explanation: Flat blade/curve blade/arrow head/vaned disc turbines are generally used for gas-liquid mixing. Helical screw/ribbon mixer/gate anchor are generally used for solid-solid mixing. 11. Which of the following is true with respect to Carbonation? Explanation: All of the mentioned are true with respect to Carbonation. 12. With respect to dipping oil emulsions, which of the following is true? Explanation: All of the mentioned is true about dipping oil emulsions. To practice all areas of Food Engineering for entrance exams, here is complete set of 1000+ Multiple Choice Questions and Answers.